The Solar Investment Tax Credit (ITC) is set to expire December 31, 2016. This impending cutoff, alongside the ongoing global UN climate treaty negotiations at COP21 in Paris and US congressional debate on tax extensions has brought the relevance of the ITC to the forefront. Conversation has focused on the potential impacts to the solar industry should the credit expire, and we at Solar Lead Factory have been closely following this issue. As a company operating within the solar industry we have an obvious interest in this debate. Every month we interact with thousands of American consumers interested in going solar. This number continues to increase steadily; the call from the American public is clear – they want more solar. So what should congress do now? What is the ITC, any why does it matter? The ITC is a 30% federal tax credit which reduces the cost of solar system installations for residential and commercial properties. The ITC benefits any company which develops, installs, or finances a solar project, as well as homeowners who outright purchase solar systems and have them installed on their home. The ITC started on a one-year-trial basis in January 2006, was extended for an additional year in 2007, and was further extended 8 years in 2008 due to the surge in solar projects. The increase in solar power generation and industry employment was/is a mega win-win for the economy and environment. However, the 8 year extension is set to come to an end on December 31, 2016. If the ITC is not extended, the residential credit will no longer be offered, and the commercial credit will be reduced to 10%. Under the ITC, employment in the solar industry has grown 86% in the last four years, with job creation approximately 20 times higher than employment growth in the overall economy, according to Solar Energy Industries Association. In addition, annual solar installation increased over 1,600% since the ITC’s implementation – a compound annual growth rate of 76 percent%! Options, pros & cons and taking the middle route. Essentially there are two options: 1. do nothing and let the ITC expire, 2. extend the ITC. There are strong arguments that ending the ITC will force the solar industry to adapt and companies will find new models. There are strong arguments that extending the ITC will enable the solar industry to continue it’s growth and prevent massive loss in jobs and momentum. This Wall Street Journal article sums it up pretty neatly. Of course, as with everything, there are good, bad, and ugly ways to do everything. The bad: ending the ITC. The ‘I’ in ITC stands for Investment, and that’s what it’s supporting. Investment in an affordable clean energy future, investment in a workforce being paid a living wage and investment in energy independence. The ITC has improved the economy and the environment simultaneously, without a doubt. Globally, other countries have enacted similar subsidies, and have seen similar success. However, nations which have completely removed the solar industry subsidy abruptly – as exhibited in Spain, for example – have undergone near instant contraction of the industry. With the potential for loss of 80,000 jobs in 2017 alone (as predicted by SEIA), the instant removal of the ITC is problematic for the economy. The loss in green technology and innovation would also be critical. The ugly: starting and stopping the ITC. If our congressional leaders were to look to other forms of renewable energy for examples in how to manage tax credits, wind would not be the place to look. 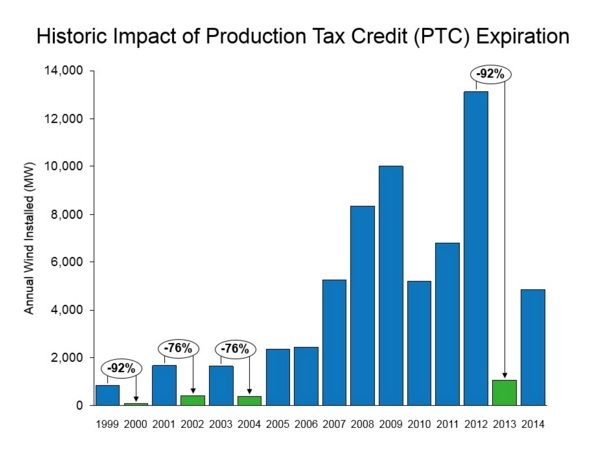 The historic on again, off again approach to the Production Tax Credit has had seriously negative impacts on the wind industry, as evidenced by the below graph. This approach is ugly because it doesn’t send a clear signal to business leaders and causes contraction & expansion in the workforce which hurts the ability to train and build skilled and professional workers. 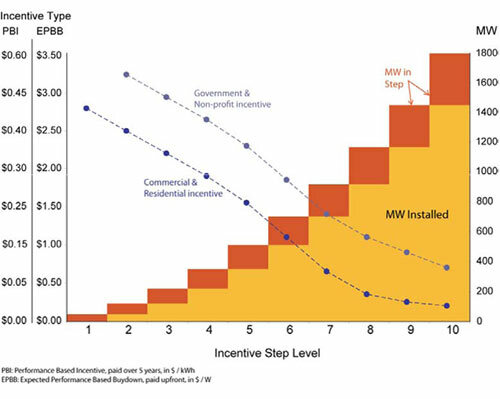 If solar is ready for the big-time, then what it needs is not to live at the whim of fleeting subsidies. The Good: clarity & ratcheted ramp down. Markets respond efficiently to clear and well-designed policies. The California Solar Initiative was enacted in 2007 and aimed to support 2,000 megawatts of solar production by 2016 by providing a subsidy that was reduced annually and was intended to be phased out. Competition flourished and California has seen a surge in solar installations and the industry has grown tremendously – despite the annual reduction of the CSI. Installers in California were not upset to see the CSI come to an end; they’re installing projects in record numbers. 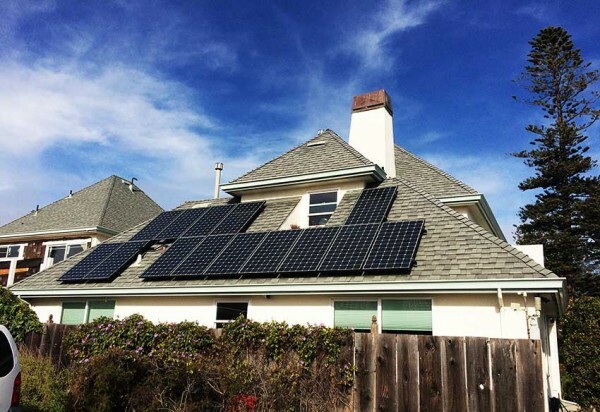 Approximately 72% of all residential solar projects in California were completed without any state incentives in the second quarter of 2014, while seeing market growth. The CSI excelled in its goal, and through the solidification of market competitiveness, prices have decreased and the solar industry is busier than ever in California. It is rumored that there are three options on the table for extending the ITC. One option would allow for all projects that have “begun work” by December 31, 2016 to be eligible (as opposed to completed by December 31st 2016). This would create a rush of projects and most likely a lot of controversy in accounting for what constitutes “begun work.” The other two options being discussed are a one-year extension and a three-year decreasing extension. The problem with the one-year extension is that it essentially takes this year’s problem and delays it until next year. The real winner, in our opinion, is the three-year extension with clear decreases from 30% to 20% to 10% to 0%. The extension in 2017 would allow the industry to make massive headway in Presidential & state greenhouse gas reduction goals, while the ramped expiration will allow new business models for financing to come to market and will allow for a transition from one model to another without swiftly and severely destabilizing the industry. California took this approach and has seen great success; other regions which have cut the subsidy cold turkey have seen massive industry contractions and job loss. Since the ITC was enacted, solar prices have consistently fallen annually while the rate of installation and panel efficiencies have continued to increase. Therefore, we believe that the reduction of the ITC over a three-year step-down framework is ideal, and will leave the economy, environment, and solar industry in a bright position. If you’re motivated to tell your Congressperson, follow this link to make your voice heard!